What Are Your LEGO Related Goals For 2016? 2015 is almost over! If you're slacker like me, you didn't accomplish any of your goals. If you're industrious and self- motivated like @SumoLego , you've gone above and beyond your LEGO resolutions. So what do you hope to achieve or obtain in 2016? Do you have new goals or are you going to carry over goals you failed to complete in 2015? The one goal I'm carrying over from 2015 is cleaning my LEGO room and setting up my train track on the table in the middle of the room, even if it means throwing everything into bins and sorting it little by little. Build Arvo brothers' Alien project (although will probably be done over Xmas.) And sell off more than I buy this year, if not in financial terms then at least in volume / storage space terms. Buy the next wave of Speed Champions and the #10251 Brick Bank. We just started buying the Modular buildings so we will add the #10218 and #10246 to the layout. Maybe #10232. I dont like it but the wife does so that means it will probably end up on the layout too. Seems like an ambitious project to finish around Christmas time but I guess it's mostly a question of having all the parts (and the instructions of course). I assume a Bricklink order was required. I have never used Bricklink so maybe that will be something I'll try in 2016.
chuxtoybox good luck on your layout. I sure do love the lego trains. Probably because I always wanted them as a kid but mom could never afford them. She did however save for 2 years to get me #6399. It was and still is my most treasured set. Goal for '16 is getting a house with a room big enough for a LEGO city/train layout. Last years goal was to buy less, build more. I failed. Miserably. I will try again. All I basically have is set #4559. It's pretty much all I can fit on the table so it suits my needs. It was the first LEGO train I ever bought but the one I have now is not the original one, which I had sold. I'm going to elevate the track on BURPS and DUPLO. I'm interested in power functions so that might be another thing to delve into in 2016. My goal is always to buy more! The book is on its way. Most of the parts are either on their way or I have them already. A few rare parts aside (which will be substituted for now), so it's just going to be the build. That is a really cool train! I have never seen it before. I like how it's elevated. It's awesome that you still have the one your mother bought for you. There's one on Ebay for $700. I'd say it's safe to say I'll never have one. Too bad I wasn't actually collecting LEGO in 1990. Actually, I wish I was collecting LEGO earlier than that. I love the classic Castle and Pirates and Western. All I basically have is set #4559. That is a cool old set! I always wanted #4558. As for power functions, I really like it. Having modeled HO scale trains the old Lego 9v is like DC power. Whereas Power Functions is more like DCC. Multiple trains can be run without a central Lego track power supply. Alot of people complain about the IR range but mine works fine on my 16'x16' L layout. If ones layout was bigger they may have to follow the train to control it. No biggy. I just hope they come out with sound modules eventually. That would be awesome!!!! After all the Duplo trains have sound! Did you build Akira's motorcycle too or are you just an ALIEN fan? chuxtoybox I love the classic Castle and Pirates and Western. 1: now I have a room for my Lego I want to get display cabinets up, which oddly enough was my plan this year, but damn... they are expensive. Just Alien. I didn't have a clue what the bike was until I googled it when it came out. @chuxtoybox - Did I make Lego resolutions? That's usually a sure fire recipe for disaster. My goal for 2016 would be buy more of the items that I really enjoy, opposed to me buying a number of sets to complete the series. Micro Fighters is an example of this. In previous years I would have bought all six even if some were not as good as the others, this time will only get the two TFA because those are the ones that interest me. Organization will also be a large goal for me. My final goal is to rid myself of all unopened sets that I invested in. I would like to rid myself of investing in Lego as it takes time and money and while there is reward in investing, I would prefer to spend my time in other ways, including building. The same as last year, keep trying to get a copy of every Lego train set produced. I'm at 61% now. My goal is to keep my teenage son from going into a dark ages and continue to nurture my young daughter's interests in Lego. @kiki180703 - Your plan sounds like my plan. I'd never leave my house. So perhaps it's a wash. I'm told sunlight and inter-personal interactions are healthy. Sunlight? What's that? Urban legends, I tell you! Mine is to buy as many as possible before the wife gets mad and puts the lockdown. Or at least when there are special polybags to be had I will buy buy buy. My goal for 2016 is to finish the UCS build project I started this year (building the big 4 star wars UCS sets #10221, #10143, #10030 & #10179 using as many of the same parts from each build that I can) without getting to side tracked buying and building other stuff. I did manage to get the parts I wanted (making some substitutions for the obscenely expensive parts... dark red 6 x 14, magnets and holders and extremely large grey wheels) but only managed to actually build the Super Star Destroyer. Failed on 2015 goals so new ones for 2016. Finish Ninjago Temple MOC for Yorkshire Brick Show in May. Assemble rest of Tanks I have bought parts for. Buy Wall-E, Brick Bank, and Big Ben. Maybe buy the new carnival set, depending on what it is. Maybe buy GBHQ, if I have any money left over. Avoid buying all small sets to save money for bigger sets. And maybe get to STEAM this year. (Though I've said that every year for the last few years). Start my own city layout. I don't have many buildings or anything so over the year i have to start building that stuff up. I really want the GB firehouse and the cinema to start with soon. 1 - Get more involved in the AFOL community. I have now met a lovely group of Scottish based afols and really enjoyed Lego chat with them. Lego was mostly a solitary hobby before. 2 - We are considering setting up a scottish LUG, that would be cool. 3 - Get to some meetings/conventions/trips. 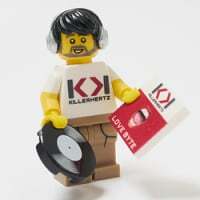 It would be great to meet other bricksetters further afield that I consider online friends but have no idea what they look like, SirKevbags for example. I know he has a beard but would love to find out if he actually has wings and always carries a wand as well! To finish bricklinking Cafe Corner and Green Grocer (nearly two years so far) and the Taj Mahal (why did I start another project without finishing the first two?). To buy the Brick Bank. To sell some of surplus bricks that I've acquired in buying whole sets just to get rare parts for the three projects (it was four but I finally finished Market Street). To LDD-ize my Berkshire steam engine for you all. I'm not setting buying less goals. I already know I have no remote chance of accomplishing them. 1. Finish organizing my minifigs. I have OCD. Not the "I obsess over this one thing, so I say I have OCD" type; I really have OCD. That makes LEGO perfect and horrible for me at the same time. I need (read: NEED!!!) my minifigs organized a certain way. And I'm almost done. I've already set a goal of no more new set building until I'm done with the minifigs. That means I have several sets sitting, waiting for me to get to them. I actually might accomplish this goal before we get to 2016. Yay me, I guess. 2. I will buy the sets on my want list first. I have a problem of seeing the new stuff and buying it when I have a list of some older stuff that I've wanted for a while, but haven't bit the bullet on. I need to stop buying the brand new set that will be on shelves for two more years when I want a minifig that is four years old. It doesn't mean I'll be buying less though; it just means my purchasing in 2016 will start with the oldest sets/minifigs I truly want and not the shiny new box on the Target shelf. 3. I will build more for my son (well, sons, but the youngest is too young to have caught the LEGO bug yet). Some of you may be familiar with the children's story The Little Blue Truck. I built him a minifig-scale version of the truck. He loves it. Despite getting various sets for his birthday last year, that's the LEGO vehicle he still loves the most. It may also be the only MOC I've actually finished since I was a child. He wants me to build him a fire station, and a big fire truck, and a this, and a that, etc., etc. There are sets of some and not of others. I want to build him the ones there aren't set for. I'm in the process of bagging/boxing up all of my collection. I'm going to focus on my Bricklink store and just sell Lego. Of course focusing on selling real estate since that's my real job. My goal w/ my BL Store is to use profits to pay off some student loans and misc debt. I need to clear out a bunch of my old collections that are taking up space. Anybody want some Star Wars Mighty Muggs? Spend no more than $100/month on Lego. I've had a problem with some seriously waning interest in Lego for the past four months or so, so my goal for 2016 is to finish some unfinished projects I've had with restoring old sets and selling some things I don't want and then really try hard to start working on some of the MOC ideas I've had floating around in my head. Basically, my 2016 goal is to spend more time with my Lego. I think you'll be underwhelmed with my impact on the results. Now that I've created a little bit of shelf space, I want to finally get round to building and displaying some of the larger boxed sets that have been knocking around the man-cave for months (if not years). Well, this year I finally moved most (dear god, I hope it's most - god knows what forgotten boxes of Lego are lurking in wardrobes) of my childhood Lego from my mother's place to ours. So next year I want to actually play with it! I particularly want to build all the medieval-themed stuff so I can see what bricks are left to extend my village after that. And my partner and I have always wanted to do something really ambitious like a Gothic cathedral, which would fit well... not sure how we're doing for grey bricks, but I guess I might finally use Bricklink to get more if it comes to that. 1.To get the final few pieces I need to build the grand carousel, and display/sell it at bricktastic, which I'm really looking forward to in 2016.